Causes of this condition range from traumatic injuries and overuse (training and exercising too hard) to age related wear & tear. Unfortunately the above mentioned treatments may not always be desirable or suitable for every person or additional help is required. 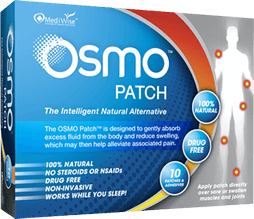 The OSMO Patch is a natural alternative that is able to draw fluid from the body supporting the reduction in swelling and pain due to swollen knees, making it ideal for fluid on the knee.